The canton has an area, as of 2011[update], of 1,728.8 square kilometers (667.5 sq mi). Of this area, 43.4% is used for agricultural purposes, while 30.7% is forested. Of the rest of the land, 20.1% is settled (buildings or roads) and 5.8% is unproductive land. 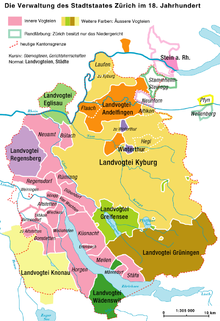 There are, as of December 2015[update], 169 municipalities in the canton (Politische Gemeinden). Zürich has a population (as of December 2017[update]) of 1,504,346. As of 2010[update], 23.7% of the population are resident foreign nationals. Over the last 10 years (2000–2010) the population has changed at a rate of 12.7%. Migration accounted for 10.3%, while births and deaths accounted for 2.6%. Most of the population (as of 2000[update]) speaks German (1,040,168 or 83.4%) as their first language, Italian is the second most common (49,750 or 4.0%) and Serbo-Croatian is the third (21,334 or 1.7%). There are 17,685 people who speak French and 2,606 people who speak Romansh. As of 2000[update], children and teenagers (0–17 years old) make up 20.5% of the population, while adults (18–64 years old) make up 64.4% and seniors (over 64 years old) make up 15%. As of 2000[update], there were 531,094 people who were single and never married in the canton. There were 566,636 married individuals, 66,012 widows or widowers and 84,164 individuals who are divorced. As of 2000[update], there were 567,573 private households in the canton, and an average of 2.1 persons per household. There were 223,869 households that consist of only one person and 27,935 households with five or more people. As of 2009[update], the construction rate of new housing units was 5.3 new units per 1000 residents. As of 2003[update] the average price to rent an average apartment in the city of Zürich was 1288.84 Swiss francs (CHF) per month (US$1030, £580, €820 approx. exchange rate from 2003). The average rate for a one-room apartment was 733.01 CHF (US$590, £330, €470), a two-room apartment was about 1009.94 CHF (US$810, £450, €650), a three-room apartment was about 1192.66 CHF (US$950, £540, €760) and a six or more room apartment cost an average of 2550.35 CHF (US$2040, £1150, €1630). The average apartment price in the city of Zürich was 115.5% of the national average of 1116 CHF. The vacancy rate for the canton, in 2010[update], was 0.63%. From the 2000 census[update], 497,986 or 39.9% belonged to the Swiss Reformed Church, while 380,440 or 30.5% were Roman Catholic. Of the rest of the population, there were 29,592 members of an Orthodox church (or about 2.37% of the population), there were 1,435 individuals (or about 0.11% of the population) who belonged to the Christian Catholic Church, and there were 70,897 individuals (or about 5.68% of the population) who belonged to another Christian church. There were 6,461 individuals (or about 0.52% of the population) who were Jewish, and 66,520 (or about 5.33% of the population) who were Islamic. There were 5,878 individuals who were Buddhist, 6,024 individuals who were Hindu and 1,456 individuals who belonged to another church. 165,324 (or about 13.25% of the population) belonged to no church, are agnostic or atheist, and 50,090 individuals (or about 4.01% of the population) did not answer the question. As of 2010[update], Zürich had an unemployment rate of 3.9%. As of 2008[update], there were 12,507 people employed in the primary economic sector and about 4,227 businesses involved in this sector. 143,231 people were employed in the secondary sector and there were 11,383 businesses in this sector. 655,848 people were employed in the tertiary sector, with 58,796 businesses in this sector. In 2008[update] the total number of full-time equivalent jobs was 678,306. The number of jobs in the primary sector was 8,120, of which 7,771 were in agriculture, 320 were in forestry or lumber production and 29 were in fishing or fisheries. The number of jobs in the secondary sector was 133,723 of which 81,212 or (60.7%) were in manufacturing, 774 or (0.6%) were in mining and 47,014 (35.2%) were in construction. 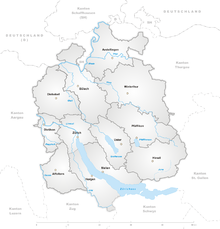 Wikimedia Commons has media related to Canton of Zürich.